The native One Bus Away iPhone App. Real-time arrival arrival information for public transit. Map display of stops and routes. Nearby stops search for location-aware devices. Bookmarks and recent stop history. Search for stops by route, address, and stop number. I’ve been using a test version of this app on my phone for months and I have to say it’s an extremely useful tool to see when the next bus is coming at a particular stop. Definitely has helped me with peace of mind, and it’s told me a few times that I have time for that chai or frozen yogurt. A must-have for iPhone owners. I used this yesterday at an unfamiliar stop and was able to tell that my next bus was only 4 minutes away. I like not having to tell it where I am. Just installed it and it rocks! Does this work for Link and the streetcar as well? I’m still working to get real-time arrival data for Link and the SLU Streetcar, though their static schedule data should be usable with the iPhone client (Link data will go live this weekend with the latest service revision from Metro). Indeed! I’d love to see Android and WebOS versions. I’m no coder but I understand that WebOS is fairly easy to develop for. In the meantime, the iPhone version of the site works really well on my non-iPhone device. All we can do is cross our fingers about a WebOS version! I think the hard part will be expannd the app to include ST and Snohomish Country:(. I’m working on a WebOS version of this app. Hope to have it available next week :). Heh, I think you mean “peace of mind”. Brian: do you guys have a tip jar? People charge money for vastly inferior products. I’ll second that? Why are you not charging for this? Even using the One Bus Away web site beats many of the pricier iPhone apps. I’d gladly pay for it. We had so much crap before…. Then we had the cool concept app Seattle Bus Map. Cool idea. Looks like it would look cool. And it has a map!!! but was never updated, crashed all the time, is a whopping $10!!!!! And now, a blessing. Well done, well engineered. FREE! (not that we need free, but if you charge, it should freakin’ work!) And FULLY functional. Thank you thank you thank you!!! Yes, where can I donate? Seattle Bus still not good. Seattle Metro Didn’t look worthwhile. 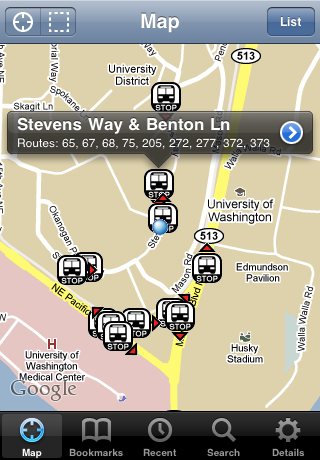 Seattle Bus Map Version 2.0 makes it a real app, nice maps and moving buses. One Bus Away – Can’t beat free. ! This app is great! What would make this app more awesome would be if we could set timed alarms on bus stops. For example, if a bus is within 5 minutes of a bus stop, an alarm fires and tells me to get over there before I miss the bus. Man. Now I want an iPhone more than ever. Ballmer is not going to be happy. So I wanted an iPhone but didn’t want to switch from Verizon…..so got the Blackberry Storm. Will anything like this ever happen for Blackberry????? Just downloaded on your recommendation…thank you! so is there an app for the palm pre? the website version is just not the same.If not, someone mentioned using the iphone app not on an iphone, anyone have any luck with that? is this a sophisticated techy trick or anyone try it out?